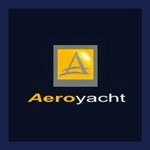 Conceived from the ground up the advanced Aeroyacht 110' luxury catamaran is today's most innovative performance yacht. 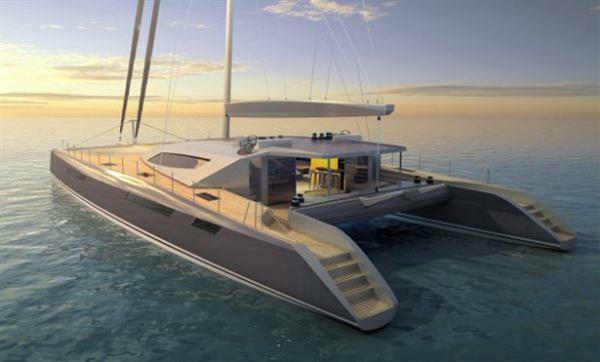 As one of the largest composite catamarans in the world she is the first model and part of a sleek, new range (A95', A110' and A125') representing the ultimate high-performance, supremely styled - 21'st century world traveler. 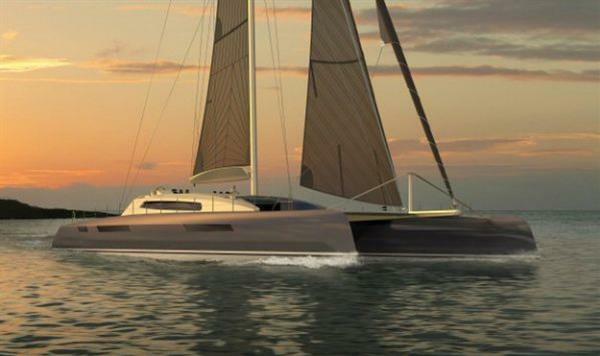 Designed by Gregor Tarjan - founder and president of Aeroyacht in collaboration with the renown multihull-naval-architect team of Morrelli & Melvin and Paul "Whirly" Van Dyke of Steve Fossett's "Playstation" fame, the 35 knot capable Aeroyacht 110' luxury catamaran characterizes the "next generation" of high-performance sailing vessels. 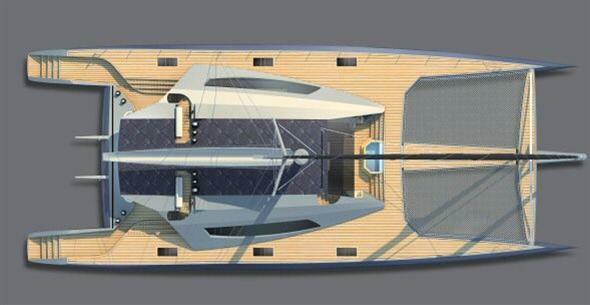 No compromise has been made to create the fastest and most beautiful yacht afloat. The international press calls the A110' the "Wally" of catamarans as her striking styling and a top class finish set her apart from the crowd. 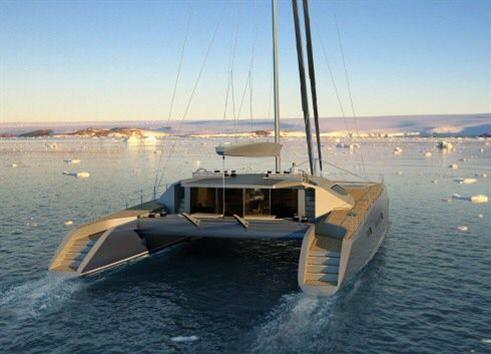 Recently voted by French magazine Design @ Home - famed designer Ora-Ito's all-time favorite boat is our own Aeroyacht 110 catamaran. Special emphasis on self sufficiency and ecological consciousness has been incorporated into conceiving this landmark vessel. 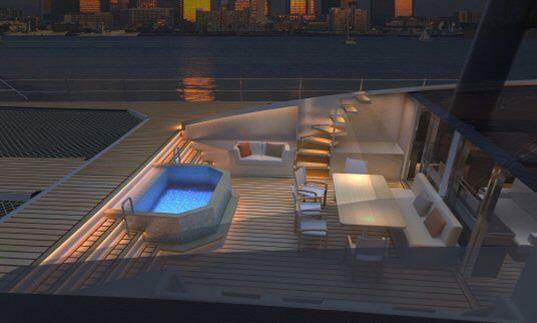 A huge array of deck mounted solar panels, optional wind turbines and environmentally friendly building materials have been utilized to make this ultra-luxury yacht in tune with our times. This listing is for a new semi-custom build with approx 28 months delivery from date of order. Sail lockers in forward hull compartments. Forward - VIP guest cabin with en-suite head and shower, hanging lockers, desk, and stowage. Amidships – Owner’s cabin with en-suite head and shower, hanging lockers, desk and stowage. Daggerboard trunk. Aft – Galley with pantry, food prep center, stovetop/oven, refrigerator/freezer, crew mess and washer/dryer. Engine compartment – diesel engine with running gear and propeller. Diesel generator and switchboard. Rudder and steering gear. Large side-opening transom “beach-club” doors, storage for dive equipment and water sports toys. Sail lockers in forward hull compartments. Forward - Twin guest cabin with en-suite head and shower, hanging lockers, desk, and stowage. 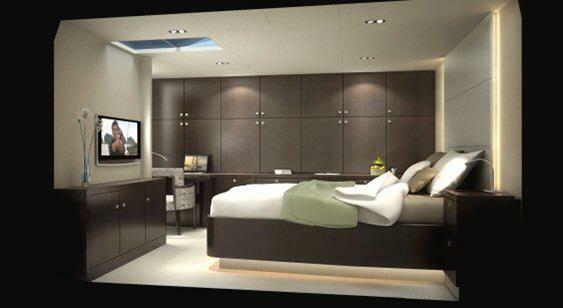 Amidships – VIP guest cabin with en-suite head and shower, hanging lockers, desk and stowage. Daggerboard trunk. Aft – Crew cabins [(1) double and (2) singles], with shared head and shower, hanging lockers, and stowage. Engine compartment – diesel engine with running gear and propeller. Diesel generator and switchboard. Rudder and steering gear. 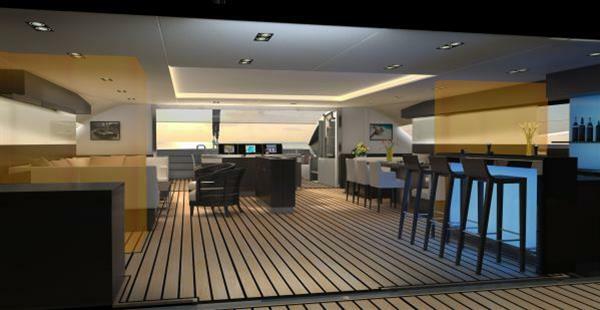 Large side-opening transom “beach-club” doors, storage for dive equipment and water sports toys. A framed glass sliding door assembly leads from main saloon forward to loggia. A bimini extends 66” forward from the leading edge of the deckhouse. Centerline, forward facing seats (module on forward side of sliding door assembly). Molded-in forward deckhouse seating, port and starboard. Molded steps leading aft to deckhouse hardtop for access to upper helm stations (Starboard only). (4) molded steps leading to forward upper decks. Molded-in settees with serving tables and centerline storage. (4) molded steps to upper side decks, port and starboard. Forward – Hull crossbeam and longeron. Forward deckhouse lockers (port and starboard for fenders and mooring lines storage). 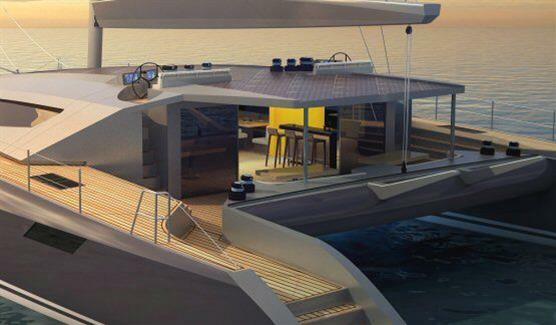 Deckhouse hardtop with integrated solar panels with mast and jib track. 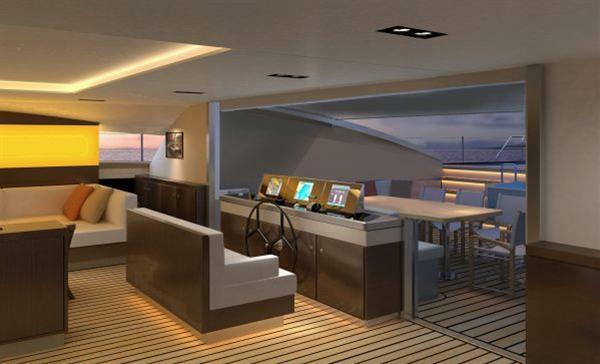 Aft deckhouse bimini- hardtop with twin “semi-fly” helm stations and sheet control winches (port and starboard). Molded steps on inboard side, port and starboard, for helmsman crossover and access to main hardtop. Molded steps leading from aft cockpit to upper helm stations (port and starboard). Mainsheet traveler track located aft of double settees and integrated into top of aft crossbeam structure. Sheet control winches (port and starboard). (4) molded steps leading down from aft cockpit to transom main boarding deck (port and starboard). 16’ Dinghy (shore boat) and lifting/lowering platform davit. ICON A5-amphibian aircraft (2 seat sports plane) Jacuzzi with waterfall/ wet-bar in forward loggia Maximum security “safe-room” Twin air-generators located in lockers (port and starboard of forward loggia) Push-button command system by LANTIC controlling entertainment, cabin and on-board information.